Look back for one brief moment to the first days of the phone hacking revelations that ultimately led to the Murdoch empire closing the Screws in a last desperate bid to keep the bid for 100% control of Sky in play. 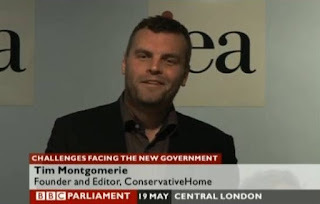 Into the fray waded the well-intentioned but utterly clueless Tim Montgomerie, then at Conservative Home, to declare that “This is about revenge, not phone taps”. It wasn’t, because it was. Did Monty bother to ask any of those involved - Nick Davies, for instance - if they were part of what he claimed was a Labour Party hit job? Probably not. All he did was to take the then received wisdom among equally badly-informed right-leaning bloggers and pundits and declare it to be fact. It was a spectacularly wrong call, but it was not the only example of the genre. Nor, it seems, has this habit left him in the intervening years. We know this because Monty was at it again the other day, approvingly Tweeting the Times front page and telling “It looks like @OwenJones84 and @pollytoynbee might just get the Labour Party of their dreams”. This alleged “Labour Party of their dreams” would, it seems, be one led by Jeremy Corbyn. There was more. 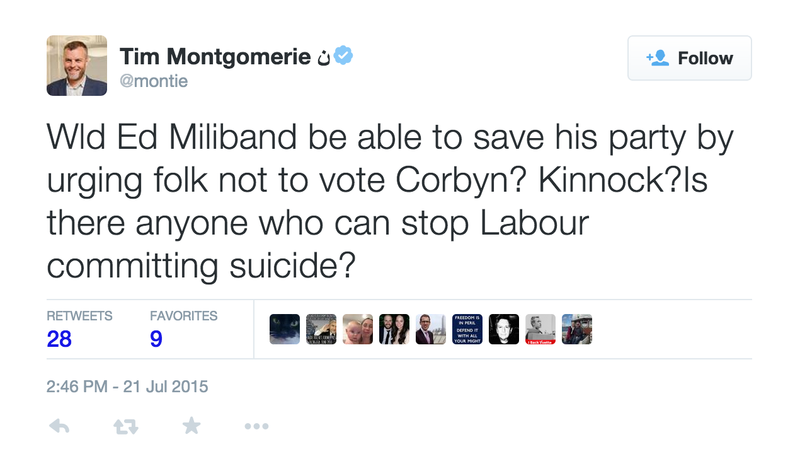 “[Would] Ed Miliband be able to save his party by urging folk not to vote Corbyn? 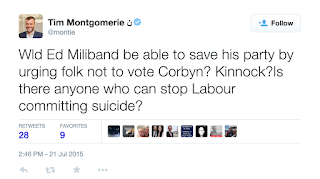 Kinnock?Is there anyone who can stop Labour committing suicide?” tweeted a by now delirious Montgomerie, letting slip the real reason for his Twitter excursion, that of indulging in partisan leering at the Labour leadership election, on the basis of a single poll, by a pollster (YouGov) that hacks and pundits on the right had been slagging off since May’s General Election for being totally rubbish. Leaving aside that the Times is supposed to be an upmarket title and a paper of record - although in reality it lost both labels a long time ago - the sad and rather obvious fact was that Monty had got it plain flat wrong in the case of Ms Toynbee, as she reminded him in short order: “Tim, check before you tweet. Just done BBC News channel on why Corbyn [would] be a calamity, plus columns”. Still, reality, eh? He wasn’t doing much better with Owen Jones, either, managing to miss that the other target of his Tweet was first and foremost about debating the matter, something his column yesterday afternoon for Comment Is Free makes abundantly clear (see HERE), as does his comment on Liz Kendall today: “Liz Kendall has as much right to stand as anyone. 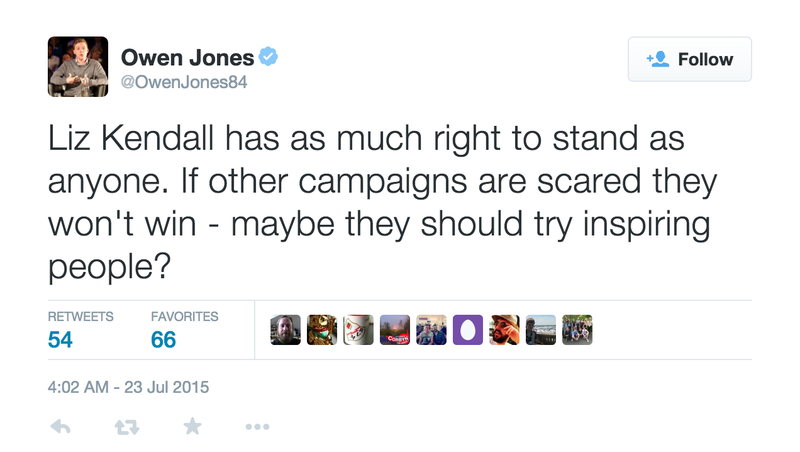 If other campaigns are scared they won't win - maybe they should try inspiring people”. Montgomerie adds precisely zero to the Labour leadership debate with his clumsy sniggering - and his inability to get his facts right. But that isn’t the point with this particular pundit: it’s just puerile Guardian bashing under the pretext of serious comment. It’s more of the His Master’s Voice. It’s the obsessive sucking up to Creepy Uncle Rupe by someone who must know that he’s been promoted way beyond his pay grade. Thus the level of high principle at today’s Times. But his loyalty is total and absolute. Montgomerie and Toynbee are cut from the same flea-ridden far right saddle cloth. The only difference is....Toynbee tries to pretend otherwise. But she's outed now, as that BBC broadcast showed. The woman is a disgusting disgrace to (even) what's left of the Labour Party. When it finally disintegrates it'll be due to her kind of betrayal. Meanwhile, egged on by the likes of Toynbee, mainstream media continues its usual gutless assault on anybody - like Corbyn - who lifts his or her head above the neocon parapet. Even that tenth rate barrow girl Margaret Beckett has reappeared like an ageing Screaming Skull Diana Ross. Corbyn will not be elected leader and the Labour Party will continue to be corrupted by far right tory New Labour. The long term result will be catastrophic for the country and its unrich citizens. Even if he WAS to be elected the likelihood is he would be quickly undermined; if New Labour could engage in mass murdering warfare and far right policies and theft they won't bat an eyelid at anything that promotes their own miserable careers. The tide will only turn when we get the same kind of organised mass revulsion that evolved in Scotland. But without the stench of nationalism. On the subject of The Times and Labour. They (Sam Coates) have written that in their YouGov poll only 5% of Corbyn supporters think Corbyn is the person with the best chance of winning the next General Election. Actuall, the YouGov question asks "Which two or three, if any, of the following are the main reasons you will vote for [CANDIDATE]?" There were 9 options to choose from, one of which was about being the best person to win the next election. Those with a half-functioning brain should be able to spot the mistake made by The Times. This hasn't stopped Pickard of the FT, Mike Smithson, Neil Coyle MP etc tweeting out that Corbyn supporters don't want to win elections. Having watched that Surley Burley interview I'm convinced that Burley was reading from a prepared script (she kept looking down at her notes such as they must have been) and realised she hadn't got anything else to hit with so just asked the same question repeatedly regardless of the answers given. As Chris Bryant and Ed Miliband have found out the "dim" Ms Burley is not very good at deviating from the prepared approach to an interview as she comes at it from a certain point of view, as directed by who employs her and possibly her own limited mind set. She ought to stick to interviewing, sorry chatting to, Cameron. It makes no difference how dim Sue (see what I did there?) is. She's a perfect Murdoch employee: Can't think, can't write, does as she's told with no questions. She's there for life. Which is why the piss must be extracted as often and as painfully as possible. I bet she can't walk and chew M & Ms at the same time.